Situated in the heart of South Wales, the town of Blaenavon and its surrounding landscape is one of the best preserved early iron communities in Wales. This industrial landscape has been awarded World Heritage Site status, having played a leading role in the industrial revolution of the 18th/19th century. The Heritage visitor center, which relates the history of the site, is located in a restored industrial school building built by the Ironmasters. 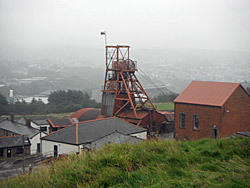 The heritage centre provides an overview of the main attractions at Blaenavon, which include the Blaenavon Ironworks (one the best preserved 18th-c ironworks of its period), the Big Pit National Coal Museum (shown above), Rhymney Brewery and the Blaenavon Heritage Railway. A great family day out. A real coal mine where you can travel 300 feet below ground, guided by an ex-coal miner who will recall his experiences of working at the coalface. The ancient village of Caerleon dates way back to the Roman times, when a fort was established here to guard the river crossing. 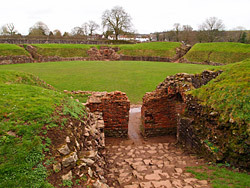 The Roman Fort once provided accommodation for thousands of soldiers and the extensive foundations of the barrack blocks and parts of the fortified walls can still be seen, including a large amphitheatre; one of the best preserved examples in Britain. Excavations at the Roman Baths have uncovered a caldarium (hot plunge bath), a frigidarium (cold bath), a tepidarium (under floor heated room) and natatio (swimming pool). Together these provided a range of relaxation and bathing facilities for the resident legions. 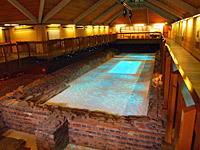 The baths are on display in a purpose built (undercover) museum in the High Street. 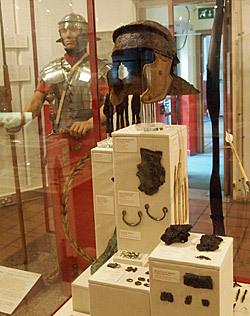 See also the National Roman Legion Museum, also located in the High Street. Excavations from the Roman town of 'Venta Silurum' provide a vivid picture of life in 2nd century Roman Britain. Excavations in the area have uncovered the foundations of Roman buildings, shops, temples and a Forum Basilica. Living museum of medieval village life, set in a reconstructed village that was wiped-out during the plagues and famines of the 14th-c. Special events throughout the year, including re-enactments. 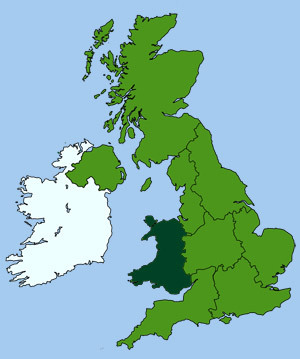 Wales contains a number of old gold mines and Dolaucothi is one of the best preserved. The main discovery of gold was made here by the Romans. 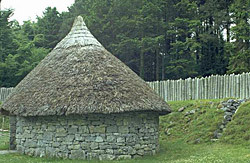 However, it has been mined in the area for many centuries and was also very popular with the celts and ancient Britons. The mine finally closed in the 1930s and the mine and ancient mine machinery are now on display. Located in the old Kidwelly tin plate works, original machinery on display. Also coal mining exhibition with pit-head gear and a winding engine. Working mill with weaving demonstrations, visitors always welcome. Mill and shop open daily except Sundays. Why not enjoy a picnic on the nearby beaches of Abermawr and Aberbach while your here. Packed with Roman artifacts and finds discovered in the town and surrounding area. Exhibits include mosaic flooring, grave goods and household items, plus weapons, armour and other militaria. Much of which is surprisingly well preserved, considering it had been buried here for well over a 1000 years. There is also a reconstructed barrack room with replica armour and equipment and at the rear of the museum is a traditional Roman courtyard garden. An absolute must see attraction for anyone interested in Roman History. Amusement theme park with over 30 thrilling rides. Includes a vertical drop roller-coaster, wooden roller coaster, sky coaster, Vertigo drop tower and the Hydro - one of the steepest and wettest rides in Europe! Plus lots of other smaller rides and attractions for younger children. Heritage mining community attraction. Based at the Lewis Merthyr Colliery, the Heritage Park is a fascinating 'living history' attraction. You can take the Cage Ride to 'Pit Bottom' and explore the underground workings of a 1950s pit, guided by men who were miners themselves. Visitor centre has a reconstructed period village street. Living Folk Museum, where historic Welsh life is represented by over 40 re-erected ancient houses, cottages, mills, chapels and farmsteads, all set-up to preserve the architectural heritage of Wales. Situated within 100 acres of woodland, parkland and gardens. Regular working craft demonstrations. Award winning family attraction. Restored Victorian country railway station, located in the lovely Wye Valley. Although trains no longer run here there is plenty to do and see, including a miniature railway and exhibition. The station buildings have been converted into lovely tea rooms and the old signal box houses irregular craft and art exhibitions. Children's play area, walks and countryside trails.